The 2005 Montrose has a saturated purple color. As backward as one would expect of a St.-Estèphe, it offers notes of sweet blackcurrant and black cherry fruit, earth, graphite and spice. It is medium to full-bodied, moderately tannic, and still a decade away from prime-time drinkability. This 30+ year wine is clearly outstanding, but not one of the vintage’s most prodigious efforts. Drink 2025 - 2035. Fashioned from a blend of 65% Cabernet Sauvignon, 31% Merlot, and the rest Cabernet Franc and Petit Verdot, the 2005 Montrose exhibits huge tannin, powerful floral, blueberry, and cassis flavors, and more weight as well as richness than last year. While surprisingly high in alcohol (13.2%) for a Montrose, that component is nicely balanced by the high tannin and decent acidity. This blockbuster will need a decade or more of cellaring. Anticipated maturity: 2017-2040+. 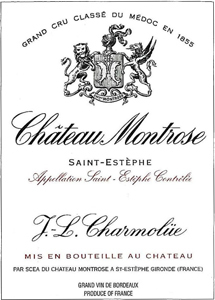 The big news in Bordeaux is the potential sale (it had not been finalized at the time of publication) of Chateau Montrose. The 2005 Montrose does not quite measure up to the 2003, but it is a beautiful effort. A blend of 65% Cabernet Sauvignon, 31% Merlot, and the rest Cabernet Franc as well as a dollop of Petit Verdot, it possesses an inky/blue/purple color in addition to a sweet, provocative nose of creme de cassis, crushed rocks, graphite, and subtle wood. Medium to full-bodied, elegant yet powerful, fresh, and nuanced, the acids are higher and the pH lower in 2005 than in 2002. The 2005 should be a long-lived classic, but patience will be required despite the relatively high alcohol (13.2%), which is counterbalanced by some of the highest tannins ever measured. Anticipated maturity: 2015-2035. This continues to be very tight yet I loved drinking it the other night at dinner. Loads of spices, berries, meat, cloves and chocolate on the nose. Full body with soft, silky tannins and lots of rich fruit. Still chewy. This is just starting to open up now. Drink or hold. Raspberries, currants and spices on the nose. Full-bodied, with a very focused palate of fruit and fine tannins. Fresh finish. Long. Racy wine. Tasted blind. Sweet, luscious nose. Lots of raciness and grace. Masses of tannin buried under really rather fine fruit. Dry but not drying finish. Pretty sophisticated. Good bright ruby-red. Very ripe aromas of plum, flint and nutty oak. Large-scaled, rich and explosive, offering impressive volume and a sensation of power. The ripeness here verges on syrupy and this lush, round wine may well need a decade to lose some of its baby fat and assume its adult shape. The big, ripe tannins coat the teeth. Savoury, berry nose and generous mouth-feel. Fruit closed and chewy tannins. Lots of promise and a big finish. Drink from 2011. Awarded 3 stars.